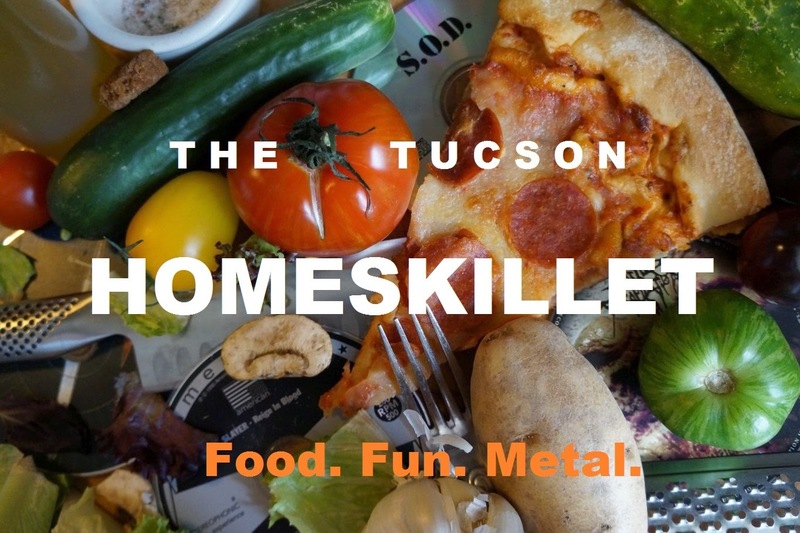 The Tucson Homeskillet: Kneel Before The Altar Of A Meatless God! Pretty sure it all started with a link. It was a few years back, I had just left the life of a chef to work in a library and start a food site. Me being a lifelong fan of Metal music and also being a big time eater and lover of food, I'm pretty sure someone sent me a link via social media with the tagline: "Dude, you gotta check this guy out." The link took me to a YouTube page dedicated to someone calling himself the Vegan Black Metal Chef. Okay. The Black Metal thing I was immediately down with as was the chef part...but "vegan"? It looked cool but I wasn't immediately sold. So I clicked on a video where he was making Pad Thai. Sure. I mean, I was pretty convinced that this whole thing was a joke. 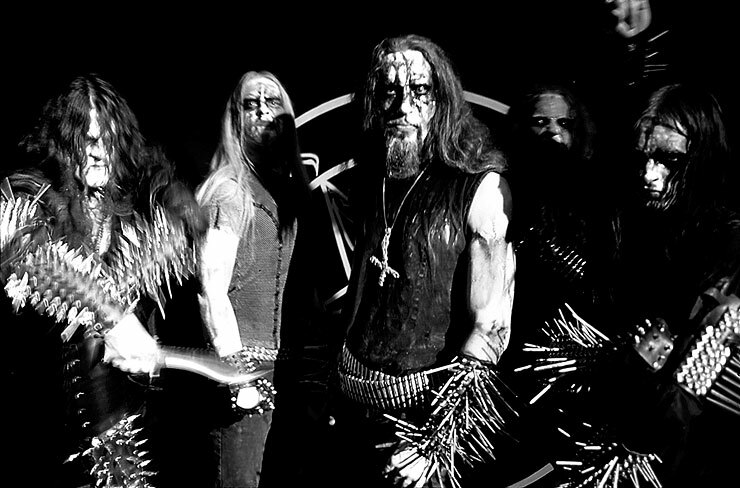 Some guy in corpse paint, maiming food and then sacrificing it all to some slop altar all in the name of instant and brief internet fame. After the initial bleating of his name over and over again in the sort of goblin squawk that some Black Metal vocalists strain, the video actually turned a respectable corner. Wearing chain mail and harsh vinyl gauntlets, the man in the makeup began to actually cook food. Brandishing a wicked blade you might see in a Dungeons and Dragons playbook and doing it all in candlelight, the Vegan Black Metal Chef took you from what ingredients you will need, what to do first, how to cook and assemble and all the while using non-animal products to do so. About halfway in I didn't even mind that he was cooking vegan. In fact, I really didn't notice. This guy knew what he was doing and I was an immediate fan. The best part was, the Vegan Black Metal Chef was funny. Keeping with the whole "Black Metal" motif, he tells you to "crush the s--t out of the peanuts" and "this is so much better than store bought because store bought sauce suuuuuuuucks!" Not only was I learning, but I was laughing too, all the while getting my Metal fix in as blistering darkened music loomed in the background while his lesson goes subtitled seeing as he is near gargling the recipe to you in demon speak. When that video ended I instantly started another. Then another. Pretty soon I was a subscriber to his site, followed him on social media and began posting his newest videos on my own online pages. And I'm not even a vegan. Far from it. A few months ago I got a message on social media: The Vegan Black Metal Chef was writing a cookbook and created a Kickstarter campaign to get it going. Oh, I may not have a ton of money, but this guy is going to get some of mine because I want that cookbook out on the shelves for everyone to savor. Vegan or not, the guy in the bat wing shoulder cloak knows what he is doing and I knew that his manual would envelop most run of the mill Food Network inspired cookbooks. Forget the boring old 'brunch ideas' and 'super simple supper' recipes you've bored over again and again, the Vegan Black Metal Chef is here to burn all that tripe down (well, not actual tripe, that would mean cruelty to a cow) and build a tasty fortress of gastro-ingenuity without the use of real cheese or meat. I've seen it be done on YouTube, now I just need it bound and printed. "Your website has an image of a piece of pizza that clearly has animal based product on it. Since I cannot condone the use of animal based ingredients, can you send me something else?" So I sent the Vegan Black Metal Chef a few articles that could be deemed "vegan"; one was about a local beer house and the other was a local brewery. That's...what I had. Luckily those links seemed to satisfy the dark lord of the kitchen and on November 3rd 2015, myself and the Tucson Homeskillet got a nod from the wicked sorcerer de cuisine sans animale. A couple of months later, a package arrived. In it was his cookbook. Immediately I flipped through it and just as quick I knew this thing was amazing. "The Seitanic Spellbook" (for those that might not know, seitan is pure wheat gluten that a lot of vegetarians and vegans use in the place of meat, it has a similar consistency to some lean proteins especially when cooked and seasoned correctly) is what you would expect from the magic realm of the Vegan Black Metal Chef. Right off from opening the blackened folio of heightened consciousness cuisine, there are skulls, fire, pentagrams and most importantly a mission statement. The master invokes the conclave of what "traditional" plant based cooking is meant to be and smashes that notion like the brains of his enemies. He sticks tried and true to keeping as close to non-animal based components as possible but using his own experience and taste to elevate each dish. But just like his website and videos, the VBMC crushes the usual elitist and sometimes tasteless takes on what it means to eat and live vegan. This guy makes it fun. Like really fun. And that is something the lifelong devotees and the curious onlookers of the vegan cabal need these days. The book starts off with a breakdown of cuisine from around the world. Not too sure what they are dining on in Hell these days, but I am sure it might involve a lot of garlic and some Sriracha, which the chef here uses a good amount of. Peppered among the glorious offerings of less than barbarous fare are essays and helpful hints to assist you in your ascent into a food coma oblivion. Such as, and I had no idea about this, there are "vegan" wines compared to other wines. Did you know this? We sure didn't. Apparently some wines are filtered through bone marrow and fish parts....but why? Anyway, the good thing is that vegan wine is cheaper than those that invoke gelatin to make them sweeter or more palpable to the common tongue and for that we bow our heads before the enlightened deity and continue forth on our quest for real yummy vittles. You are taken on a journey from Euro-American, through Asia, South America, Indian cuisine, Italian and the Middle East. Each stop, much like the notion of this entire hell spawn of recipes and concepts, breaks down the "traditional" approach to each dish. The best thing is, the change is really quite simple. All you have to do is tweak a bit here and there, perhaps spend more time at Asian markets and co-ops to get you ingredients, but overall the switch really isn't that grotesque. And this is coming from a Metalhead that eats whatever he wants. Honestly, "The Seitanic Spellbook" really makes me want to challenge myself and go vegan once in a while. I like vegetables. If it wasn't for the potato how would we get french fries and vodka? Think about it. Perhaps you going vegan wouldn't be so rough if you follow the examples set in this book. I bet you can do it. Each section opens up to one initial recipe, folded between the two pages. On the left, you have the "Spell Reagents" (aka the ingredients), which are always stripped down and easy to obtain and follow. Next comes the play by play on cooking the dish all done with the vernacular that we have all come to love and fear from his online videos. Sure there's no Black Metal playing (um, this is a book yo), so you're going to have to supply that on your own. Might I suggest some early Emperor, Mayhem, Dark Throne, Carpathian Forest and that Chris Gaines thing that Garth Brooks did trying to do some sort of switcharoo on us and all he did was don a black wig and flavor savor. Oh, and you need to cook by candlelight. And with a dagger of eternal nightmares. And pepper. Intertwined in these works of gloom and deliciousness, are the Chef's advice on how to shop. Oh you think you can just waltz into any Piggly Wiggly, buy some non-meat item and then be all "Hey, looka me...I'm all vegan and crap!" No. You need to read the labels, you need to seriously give some thought into what you are putting in your cart and then putting in your mouth. Hidden in so many so called "vegetarian" products contain microbes of animal spleen or cricket dust. It happens and if you want to follow the doctrines of the Vegan Black Metal Chef you are going to have to change the way you shop. All it takes is perhaps a course to a different food supplier, maybe sourcing from a local farmers market or not supporting the gratuitous big box gluttony that is slowly poisoning you with their labels of "organic" and "healthy". This scripture of evil benediction will guide you into the darkened light of a new consciousness with just the simple task of modifying a thing or two here and there. Regardless, this book is just chock full of instructions on how to inventory your kitchen to create the best freakin' food you could possible conjure up to appease the wicked gods of the culinary underworld. Did you know you can recreate the flavor of shrimp by using the Japanese Konjac root and a few spices? My favorite parts have to be the "Oracles of Inspiration" which are extensions of the meal plan and recipe you were just provided with and uses the components to further your excursion into the deep forest of flavor. You have the vegan cheese and made black bean "cheese" burgers...now what? How about mac 'n cheese? A burrito? Lasagne maybe? He doesn't just proclaim "Go get me some green beans for this one dish!" and then leave you hanging. Using the index in the back, locate 'green beans' and pursue your way into the vortex of heavenly spite and yummy tummy scorn. There is no end to the concepts of eating vegan in this book and flavor is just the beginning. Through it all, the Vegan Black Metal Chef arrives on occasion to inspire and be the torch down the long dungeon of uncertainty and possible fleeing. With that razor sharp wit and confidence, he has pages dedicated to knowing what the book's intentions are, what it means to live a cruelty free life and to be the best darn person you can be. All the while cursing, praising Satan and making you laugh the whole time. This cookbook may not be for all people just due to the subject matter and the use of Black Metal and skulls to mach your guacamole, but no one can deny the care, thought and time it went into creating such a demonic reach of exquisite food and flavor. If you are looking for fancy vegan cuisine using only the dried berry emulsion from the rarest bloom found on the tallest mountain only cultivated by a secluded indigenous people for one week out of the year...you need to talk to you dietitian/yoga instructor named Chip because this guy uses onion powder and stuff you can purchase down the street. The idea of going vegan shouldn't be terrifying or really that hard. It should be about awareness and caring about how you live in this world and what you do as a part of it. That and eating some good stuff. The only "terrifying" thing is his collection of battle weapons. I mean, how do you chop a leek with a double bladed axe? 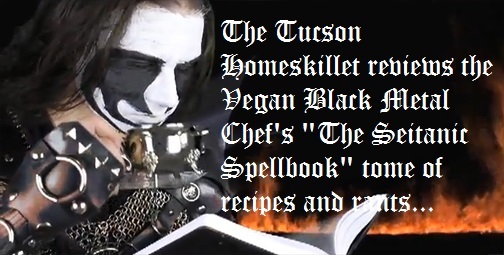 Not too sure, but the Vegan Black Metal Chef makes it look so easy. 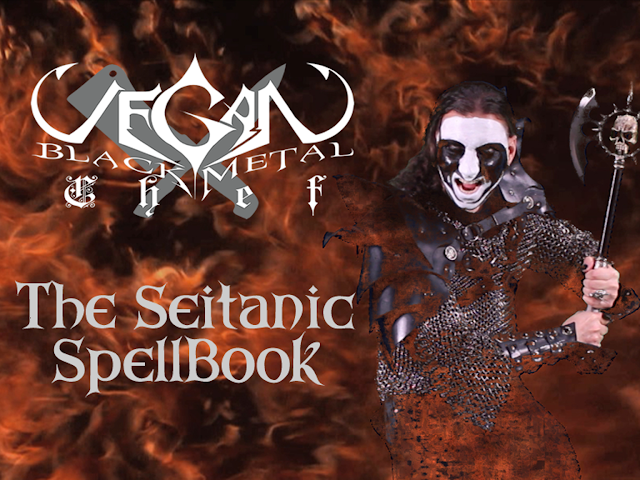 "The Seitanic Spellbook" needs to be in the collection of any serious home cook looking for options, vegetarians and vegans needing a well needed push into safer territories and for Metal fans because this man does it right. It's smart, it inventive, it cracked me up and above all it made me super hungry. I look at cookbooks all the time and this one actually had me panting and drooling. Best part is, there isn't one animal ingredient in any dish and I'd like to see Bobby Flay pull that off. Plus I don't think he could pull off the corpse paint either. Or maybe he could. I'd like to see him try. Blessings and curses to you Vegan Black Metal Chef. This scroll of savory darkness is one to cherish and keep bound forever in a sarcophagus buried deep in the forlorn wastelands of Nefelheim only to be procured by the summoning imps beyond the freezing damnation mist when their hunger becomes malevolent. Or keep convenient on top of the fridge like I do.